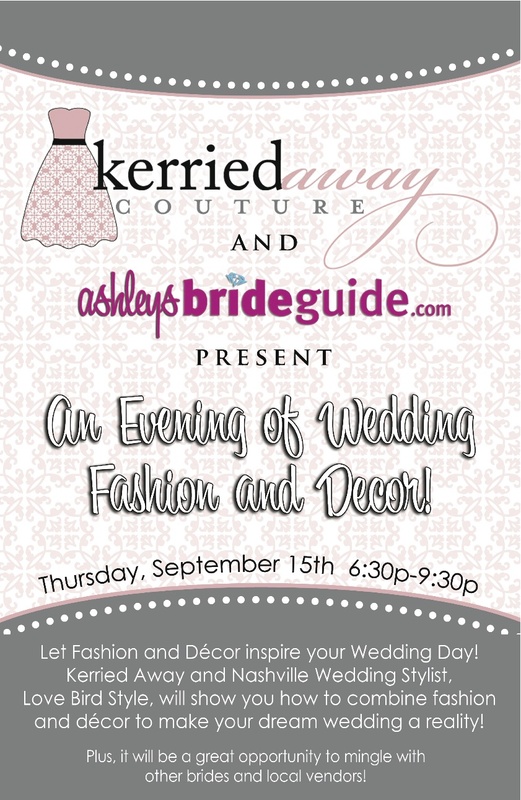 I’m thrilled to announce that Ashley of Ashley’s Bride Guide has asked Lovebird Style to co-host an event with her and Kerried Away Couture on September 15, 2011. Kerried Away Couture offers custom-made bridesmaid dresses where you get to choose the fabric and style of the dress. I will talk about how brides can define their unique wedding style and carry out their design. To read a little more about what we’ll be discussing, check out this post and this post. The evening will be full of fun, fashion and wedding decor. Tickets are free, but you can reserve your seat here. We hope you can join us!